If you want to install WordPress on Xampp you have to do some step and In this tutorial I am going to tell you how you install wordpress on your local computer with the help of Xampp. Basically it is not the tricky task so why I am discussing this with you because many people will download both the software simultaneously and after that they didn’t install the whole setup so it is some tricky but don’t worry, It is not as tough that you are thinking. So shall we begin. 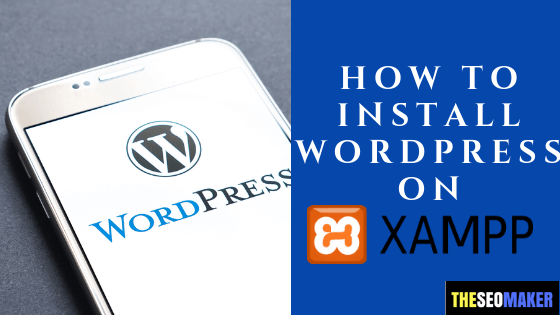 I will demonstrate you by the help of images so you can easily understand what is the full process to install WordPress on Xampp. first of all you have to download Xampp server on your computer so just open your prefered browser and type xampp download with the first link https://www.apachefriends.org/download.html, download the Xampp server for your computer. when you download the full setup of Xampp server open it and run the full setup, this window will flash one time when you installing your Xampp server. Then click on ok and let the process start for installation of xampp. In the installation process choose your destination where you want to install your software by default it is selected c drive and you can choose that too. After that installation process will begin. Wait for that. In the installation process this pop-up box will appear in front of you. Cick on Allow access. And after completing the process of installation click on finish. Then click on windows button and search for Xampp Control Panel, this pop-up box will flash click on Save. Then the main control panel of xampp is appeared in front of you. So just click on start button at the front of apache and mysql. So this is it you have successfully install Xampp server on your local computer. Now this is the time to download and install Wordpress. In the process of installing WordPress on Xampp the main part is when you download and install the wordpress. So just go the google and type wordpress.org downlaod the wordpress. When download is complete you will got the zip file of wordpress and you have to extract all the files from it. So copy this zip file in specific folder(recommended) and extract all files. And then the folder you got after extracting the zip file, you have to copy this folder and go into the xampp folder when you have created previously(mine in c folder) and copy wordpress folder in htdocs folder. Now open Xampp Control Panel and start Mysql and Apache and click on admin in front of mysql and you will redirect to web page of your local server. Without creating database for your project you can’t install wordpress on xampp server so just click on new and create new database for your project. You can take any name whatever you want. Now go to web page and type localhost/wordpress and then enter. If you got this page so you done it right or kindly check all the process again. Password-No password and Rest are same. Then you have just run the installation and this window will appear . Note:-Don’t check the box at the front of Search Engine Visibility otherwise your website will not index by search engine. Now you have successfully install WordPress on Xampp and if you have successfully done this this window will appear in front of you. Write your selected username and password to log-in into your wordpress dashboard.This will your final window appear after install WordPress on Xampp. You only access wordpress after activating your Xampp control panel and start apache and mysql. After that just type in the URL localhost/wp-admin for accessing your WordPress dashboard. That’s it you have successfully install WordPress on Xampp server and if you have any query or there are any problem while downloading and installing the WordPress feel free to comment below. If you like my article so share it on Social Media and Subscribe my blog.